"If you had a Powerball ticket worth $200,000, would you just drop it in the mail to a lottery office several states away?" Kenny and Cathy Robin Beevers dropped their ticket in the mail thinking they won a few hundred dollars, but they were much luckier. A Mississippi couple who played the Virginia Lottery mailed in their lottery ticket thinking they beat the odds and won $400 -- and then lottery officials told them they actually won $200,000, officials said Friday. Kenny and Cathy Robin Beevers dropped their ticket in the mail thinking they won a few hundred dollars -- which is still lucky, considering that only 1 out of every 14,494 people who play will win even $100. 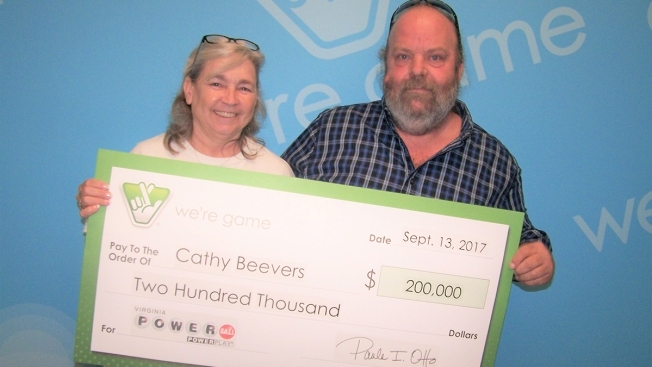 Kenny Beevers wanted to give the ticket to his daughter as a wedding present, but Ms. Beevers already had mailed it to the Virginia Lottery office. Four tickets winning $200,000 each had been purchased in Virginia as people vied to win a $759 million jackpot. When the numbers 6, 7, 16, 23, 26 and Powerball number 4 popped up, it only took a few days for the first three $200,000 winners to claim their prizes. The Beevers' ticket didn't arrive at the Virginia Lottery office until three weeks after the drawing. When officials saw the big-winner ticket casually arrive in the mail, they suspected the winner did not know the ticket's true value, officials said in a statement. Officials asked, "If you had a Powerball ticket worth $200,000, would you just drop it in the mail to a lottery office several states away?" Officials called Cathy Robin Beevers and told her the news. The Beevers decided to drive to Virginia to pick up the prize instead of trusting the mail again. The Beevers want to use the money to pay bills and make repairs on one of their trucks, lottery officials said. Mr. Beevers is a truck driver. He bought the ticket at a truck stop in Chesapeake, Virginia while driving his typical route. His ticket matched four numbers and the Powerball number. He spent an extra $1 for a Power Play, which quadrupled his prize from $50,000 to $200,000.